This might not help you since you already bought the pan, but for anyone else reading you can put your pizza stone in the grill! 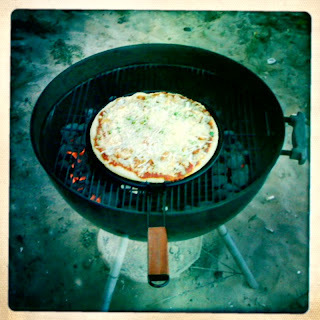 We actually always make the pizza this way because we can get the grill hotter than the oven. Yum! Carrie - that is good to know! I don't think we had room to pack our pizza stone, but when we get home we will have to try it with that! Didn't know that there were special pans. We always just put our pizza directly on the grill.